Elegant, charismatic, and incredibly committed to community service, it is no wonder why LCHS students, Georgia Cervenka (12) and Julie Lauenstein (12), were crowned Rose Princesses on October 2, 2017. 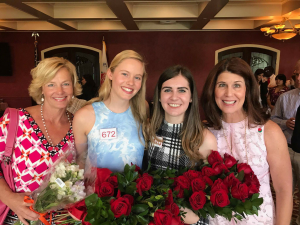 Selected out of a pool of nearly 1,000 applicants, Georgia and Julie are now members of the 100th Rose Court alongside five other senior girls. 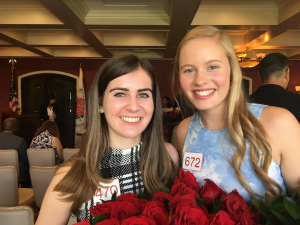 They will now serve as ambassadors for the Tournament of Roses, the organization responsible for putting on the Rose Parade and all of the festivities that it entails. Both girls are very active both at LCHS and throughout the greater community. In addition to being the captain of the varsity basketball team, Georgia is also an active member of Concert Choir, the La Cañada Flintridge Youth Council, Girls Scouts, and National Charity League. Julie boasts a different but equally impressive range of extracurriculars, not only having been a dancer for 13 years, but also serving as an ambassador for the Chamber of Commerce, a princess on the La Cañada Royal Court, a volunteer at the Huntington Memorial Hospital, and a member of National Charity League. “Making a difference in my community and helping other people is very important to me, and I am so excited to be on the Rose Court because it is the perfect opportunity to do just that,” Julie said. Both girls have aspired to be Rose Princesses for years, the honor being special to both themselves and their families. “Since I was born, it’s been my grandma’s dream that I would be on the Rose Court, because I’m the only girl in my family. I’ve always known I was going to apply,” Julie said. Georgia has a different yet equally special history with the Tournament of Roses: it has been her family tradition for years to sleep out on the Rose Parade route and wake up early to watch the parade. She would always pay close attention to the Rose Princesses, and it was these memories that inspired her to apply. Despite the Tournament of Roses being so special to both of them, neither of them actually expected to win. As the shock of their win fades and the girls grow more accustomed to being royalty, they get more and more excited about the year ahead of them. “I’m so excited for the friendships that we’re going to make and have already started making with the other members of the royal court. I feel like we have already started bonding really well and that we are just going to make connections and meet new people and be able to inspire young girls in our community,” Georgia said. In terms of advice, both girls shared a similar piece of wisdom they wish they knew when they chose to apply: don’t sweat the small things.